Winslips.com is a web-based lottery tool that makes your winning ambitions more achievable. The online application is powered by a brand-new and fully enhanced version of two extremely reliable lottery systems that we previously developed: the budget-friendly “One Ticket System” and the “Inverted Lottery System”. Chances are you’ve never heard of the One Ticket System before, but that’s because we optimized it for just a few jackpot games. Today, that technical limitation is no longer a factor. 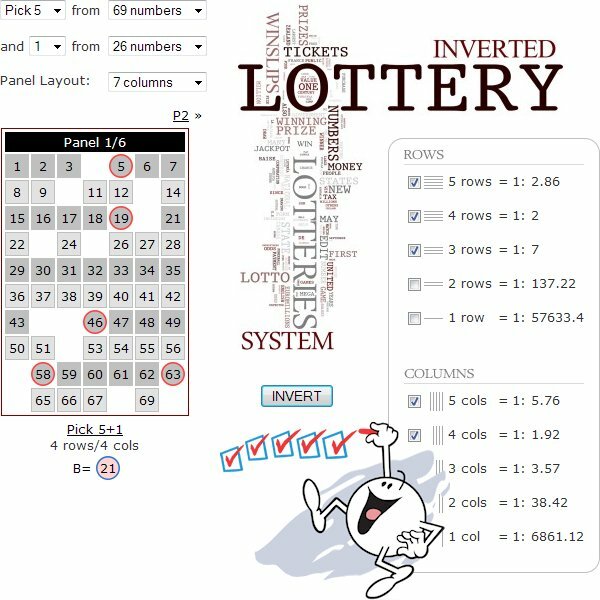 Hundreds of lottery drawing games are now fully supported. The Inverted Lottery System is of course much better known. We developed this highly successful number reduction system for plenty of lottery games, and it was used by literally thousands of satisfied lottery players worldwide. With Winslips, “things” only got better, … MUCH better! Both the One-Ticket-System and the Inverted Lottery System are now integrated into ONE powerful and easy-to-use lottery application (see screenshot below). Depending on your weekly budget, you’ll play anywhere between 1 and 8 tickets. Picking numbers from a smaller pool of numbers is ALWAYS easier than picking an equal amount of numbers from a bigger pool of numbers on the condition that the winning combination resides in the smaller pool. This condition must be met BEFORE the draw takes place. With Winslips, this is ALWAYS the case, and that’s why picking numbers with Winslips is much easier than picking numbers without it. On top of that, the number combinations that are selected by the Winslips application are guaranteed to have that typical number distribution footprint that nearly all jackpot winning tickets have. Once you’re aware of that winning footprint, you will stop wasting your money on tickets that don’t have it. Winslips’ unique Number Picker handles this extremely well. I suspect your mind works much the same as mine, not just to perfect the ultimate plan or system, but you clearly have a love of mathematics which I too have, and a clear persistence to forge ahead and find the solution to winning the lotteries. Let me tell you I admire you for this, and understand your drive so to speak. I love your system. Makes me feel like I am picking solid numbers and I do see the winning numbers on the boards like your manual says each draw. Dear Stefan, I have been using Winslips for a while now and have been very impressed with it. Stefan, I’m now a Winslips subscriber and user. Thanks for adding an intelligent approach to what can be an emotional game. I have been using your lottery system several times now and I like it a lot. Not only because of the slightly increased winning chances for big prizes, but also because of the mathematics used. Your website is a well presented and well organized portal for service. You also respond faster than other software programs I use, which is very impressive and businesslike. Thanks, Stefan! Your mathematical mind and smartness in producing Winslips is amazing. Keep up the good work. I’ve used your tips to win. No big wins – yet – but wins nonetheless. You know your system has merit, I know, so do thousands of others. Keep doing what you’re doing! Oh – and thank you! Hello Stefan, I am happy with your winning program and don’t care what others say out there. With your program I know I will win the big one soon. Stefan, Just wanted to let you know that I almost hit the jackpot in my first week of using the Winslips system, 4 out of 5 numbers for $250 for the NH Gimmie 5. Almost won 100,000 first prize. Great system. Can’t wait to hit The Big One. I’ll keep you posted. Hi. Been enjoying the Winslips system and am enjoying playing the lottery again because it doesn’t feel as if I’m just wasting money. I have been using Winslips for less than 2 months and just got 4 numbers and the extra ball. Thank you! I think this is my year to win big! Stefan, I had a few bucks on one of my cards, so I bought some time on Winslips. I think it’s brilliant. It’s obvious you did your homework. Thanks! I want to thank you for being honest with me that is why I stay with you! I have used many different systems to select the right numbers, they all claim to be the Best. However, your system is easy to use and does not cost too much to use. I have got 3 numbers several times with winslips. Still looking for 5 +. Thanks for an easy system to use! Congratulations for your very good system and for all your work. I am sending you a brief note to let you know that your system is an amazing one. The answer is in the numbers. Thanks again! Life has become easier knowing that someone like you was willing to give us a nudge in the right direction. All the best! Dear Stefan, I think your Winslips is great. Hi Stefan. I sincerely appreciate all your help and appreciate even more the time and effort you put into creating a program like Winslips for the masses to use. Thanks! Your system is more than just a game changer to me. It’s giving me new hope. Winslips is something on its own and it works “brilliant” for me at least. It’s unlike other programs which produce hundreds and thousands of combinations which nobody can afford. I’m very close to a perfect hit very soon and your program is tops. Stefan, I’m currently a WinSlips subscriber and want to say THANKS for all the effort that went into this polished program! Your program is amazing and very reliable. (editorial note – this testimonial came in when we temporarily stopped selling Winslips) … Hi Stefan, I’m seeing that you are no longer selling your software. Why? It is such an awesome product and it is rated the best out there on the web. I almost hit the jackpot with Winslips. Please continue to sell it! Stefan, I wish I could somehow help you with a testimonial that will end all doubters because Winslips works SO WELL !!! To say I am impressed is doing you an injustice, Stefan. I have – as you know – followed you for years and have purchased your books, but I do not know why I never got on board with Winslips for so long. I do assure you that I have already read the user manual twice and my imagination has again been relit. Thanks very much for keeping in touch with me all these years, best wishes and onwards and upwards. Hello Stefan, your system is the real deal and you are a genius. Thank you. Winslips gets so darn close at times. Thanks for giving us players a chance. Your system is probably the only real system out there that is consistent. I’ve only had Winslips about an hour ago and already I love it. Very impressed with your software. This is one program that I feel confident will help me win! Hello and greetings, Stefan. Congratulations, you have the only product worth purchasing on the net for lotto. I know little compared to you but I can come to logical conclusions. I like letting you do the thinking, and it is the first time a lottery, numismatics guy like you made sense to me. I love numbers. Thanks for you time and effort. I just subscribed to Winslips and I must testify to you that I love it so much. Thanks for creating Winslips. I would like to thank you for this amazing program. You rock! I am glad I joined the winslips family. I know a big win is coming soon. Love you all! Hello Stefan, your system is the best and you know it. Thank you! Thank you. Playing the lottery is fun again. I hit 4 out of 5 on Palmetto Cash 5 in 3 days of using the system. I’m impressed and very comfortable with Winslips. Plenty of options and control over what numbers the system works its magic with. I know I’ll hit all 5 soon enough. Thanks Again! Your systems are excellent. Keep up the good work helping us ‘Duffers’! First and foremost, this program is the best investment I have ever made on my lottery playing adventure. I want to thank Stefan and the team for this awesome tool. Yes, we do get big win stories and thank-you-notes in our mailbox as well. Some say we should publish those testimonials to build brand trust, but that’s a bit like ignoring our own advice to our customers. This is your chance to experience what’s it like to use Winslips. We have nothing to hide and take pride in our transparency. Follow all the action and the system’s accuracy on our Test Result Pages where we are testing the waters against one of the world’s toughest lottery games to beat: American Powerball. Winslips is not limited to American Powerball. Hundreds of national and international lotto drawing games, including Mega Millions, are fully supported. To see if your local lottery game is supported, please check our list of supported lottery games. Give Winslips a Good Spin Today! Using Winslips is easy as pie. The application is web-based and runs online in your favorite web-browser. No installation of the software is required. All you need to do is logging into a secret page and that’s it. Click HERE to see if Winslips Ultimate is available at this time. When available, unrestricted access can be obtained instantly. Your satisfaction is our absolute priority, so we do have a 100% risk-free Money Back Guarantee in place.